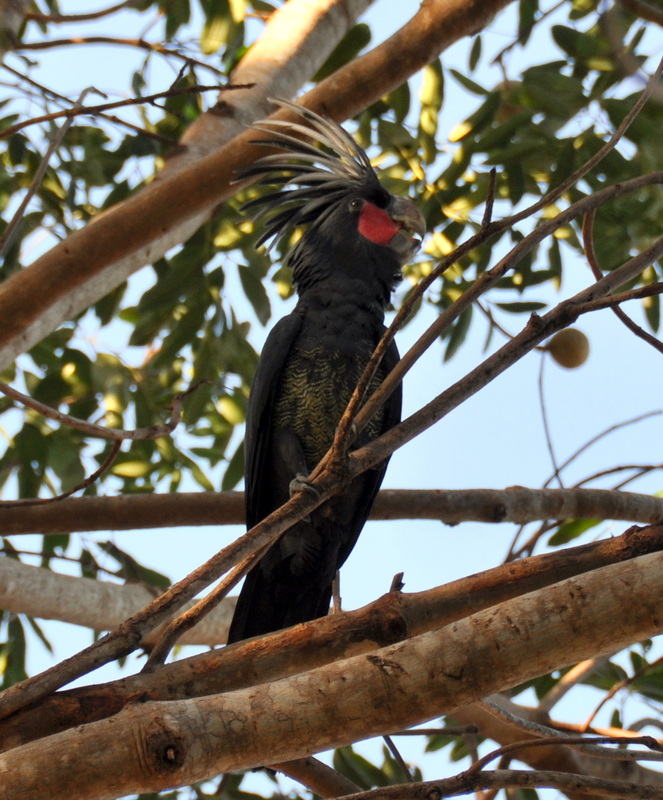 Wild Wings has just returned from travelling north on a camping holiday to visit some special places on Cape York. We didn’t head for “the tip” which seems to be the most popular destination but we did spend an interesting week exploring Iron Range National Park and then stayed in some other special camping spots on our way south to Lakefield Nat. Park and then home to Daintree. We saw lots of interesting creatures and a wide variety of vegetation that kept us busy with our reference books. We won’t be posting a complete diary of our trip but we’ll share a few highlights. In the afternoon of our first day we arrived at Artemis Station and introduced ourselves to Sue Shephard (we had spoken on the phone a couple of days earlier). Sue was busy as she was providing accommodation and meals for a road crew but after we’d put up our tent she gave us clear instructions about where to go looking for the Golden-shouldered Parrot ( Psephotus chrysopterygius) . So we headed off down the road……..found quite a few birds including the Masked Finches (Poephila personata) and the Bee-eaters (Merops ornatus) that Sue told us to look out for. However, we were not able to find the fabulously coloured Parrots until we had assistance from Sue the following morning. And they were exactly where we had been looking the previous afternoon! What a delight to watch a pair in the morning sun and then to observe the male feeding on the cleared road edge, apparently unconcerned by our presence. Sue also showed us some old nesting holes in termite mounds and explained much about the behaviour of these endangered parrots as well as her long term involvement in their conservation. It was a fascinating morning and one that we will always treasure. The second photo is not quite sharp but it does show the fabulous colours of the parrot as it takes flight so I thought I’d include it just for fun. An overnight stay at Archer River Roadhouse put us in a good place for an easy drive into Iron Range the next day and as we were packing up in the morning we were delighted to have our first glimpse of a Palm Cockatoo (Probosciger aterimus) attempting to open the fruit of an African Mahogany (Khaya senegalensis) without success, we think they were unripe. So, with such a positive start we headed north with great anticipation. 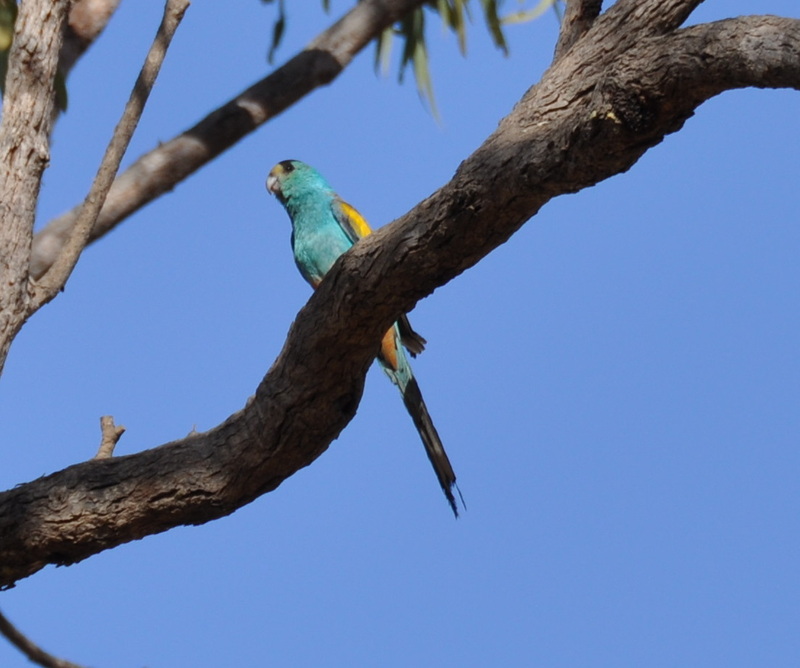 This entry was posted in Bird Observations and tagged Cape York, Golden-shouldered Parrot. Bookmark the permalink. Soooo jealous. Tried in ’03 to find GSs by myself. No luck. Did get almost all York endemics, however, within 500-metres radius of Gordon Creek campsite. Tony, we wouldn’t have had a hope of finding GS without Sue’s assistance! Although we camped at the ‘Rainforest’ site we spent a lot of time walking around Gordon Creek as well as around our own campsite, the challenge of finding ‘new’ species is lots of fun but oh my aching neck! 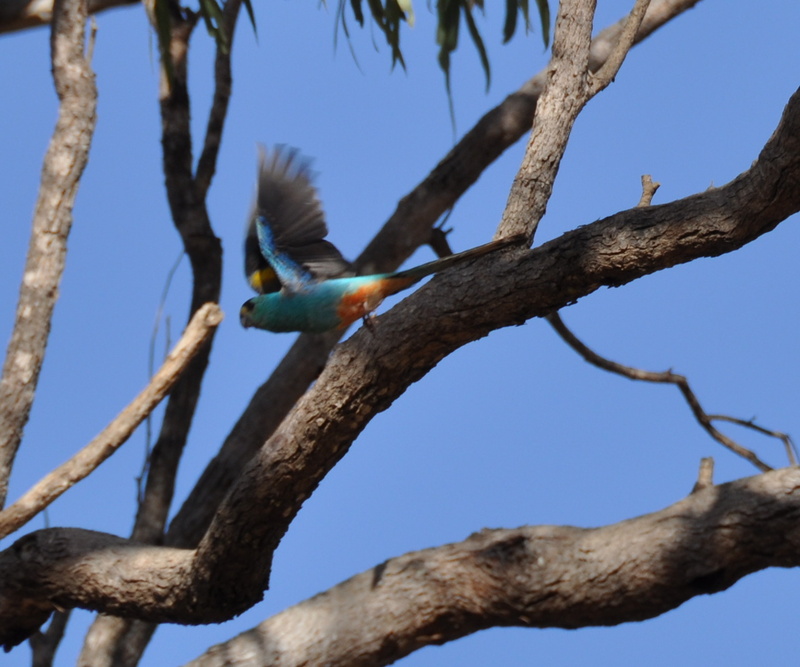 Both great sightings but the Golden-shouldered Parrot is fantastic! I’m glad you included the in-flight shot because although a bit blurred it does show the beautiful colors so well. Thanks Mick, it was so exciting and the colours were just brilliant in the morning sun. Congrats on your sightings. They are both awesome birds. We had lots of luck Eileen but sometimes that happens when you are happy to just enjoy whatever comes your way.